Here is an article about Ants that some of you may find helpful. I seldom have ant problems except for in my worm boxes occasionally. I add moisture to them and the ants go away. This spring we have noticed ants outside around the house and at church inside the kitchen. Please write if you have any questions. Getting rid of ants in the garden has to be one of the most popular questions that I have personally received in many emails and posts on the vegetable gardening Facebook page. I probably should have answered how to get rid of ants a while ago, but alas I have not created any blog post to date on the topic, so here are some remedies from the research I have conducted. What makes this topic tough is that not all remedies work, and with over 12,000 species of ants, not all ants are technically bad for your home vegetable garden. So here are some home remedies that you can give a try. The first idea is one of my own that I read years ago and that is to use cornmeal. The upside to this method is that you will reduce the ant population, cornmeal is safe for your plants, and it is fairly inexpensive and widely available at any supermarket. The downside to this method, is that it takes a lot of applications to start seeing results and you may not wipe out the colony, which is probably what you are shooting for here. Another example of a good ant fighting method that is safe for plants, is direct spraying with a vinegar and water mixture. Equal parts will do. I have not tried this method personally as I like the cornmeal method, but the idea here is that the low pH of the vinegar is not good for the ants and it will kill them. I can see an immediate issue with this method and that is, if you have a lot of ants, this could be a lot of work. It is also a direct method, which means you are only going to get what you can see. I highly doubt this will affect the ant colony underneath the soil that you can not see. If you have a small problem with ants, this could be quick and affective. If your problem is much larger, you may want to go a different route. Finally, this third method is extremely popular. Why? Because it works, and it's quick. OK, fairly quick, but you get the idea. That is to mix equal parts of Borax and something sweet like jelly in a bowl. Then place the bowl where your ants are. Because of the sweetness of the jelly, the ants will surely consume the borax laden concoction and kill the ants. Borax, also known as sodium borate, sodium tetraborate, or disodium tetraborate, is an important boron compound, a mineral, and a salt of boric acid. Powdered borax is white, consisting of soft colorless crystals that dissolve easily in water. When consumed by the ants they are unable to digest it which really messes them up on the inside. It has also been said that it wreaks havoc on their exterior as well. In other words, Borax works as a great one two punch, outside and inside of the ant! Also according to http://www.boraxforants.com/, when you make a paste with Borax, water and sugar, they will take that gel paste back to their queen which will wipe out their colony, and that is what you are looking for! There are even more solutions than these 3. You can find them at Exterminate House Ants with 13 Natural ingredients. There you will find all kinds of cool solutions, including the few I wrote about here. Thanks for you post on ant control. All are effective but borax mix is the best. Thank You! I will try the Borax today! Will these 3 methods work for fire ants? I have aphids on my milkweed plants (Davis Showy Milkweed), that I think the ants have encouraged to be there. What can I spray on the leaves that won't hurt the monarch caterpillars? One thing you can try is to spray the milkweed plants with a strong spray of water to wash the aphids off. You can also try growing plants that host beneficial insect such as lacewings that will eat aphids. I planted acorn squash, potatoes, hot peppers, and cukes. The tiny ants are eating the potato leaves. What can I spray on the leaves without hurting the plants. Will the plant veggie absorb the taste of the borax. I have ants in my potatoe raised bed. The queen is definitely somewhere in the center. Will the borax the ants bring back me harmful to the soil/ vegetables when they absorb them? Which of these methods is best to remove ants but does NOT effect bees & butterflies? I have tried the borax in jelly and it works for a little while, then dries out! I am trying DE in a little powder atomizer! It seems to be working, and it kills cockroaches too! Thank You!....my garden is loaded with teeny tiny red ants....on my way to buy some Borax and try that method. Thank You. I have a porch garden . Love it. Is borax safe to use in the vegetable garden? I Have an issue with a colony of little black ants, seems like they are under or inside my water barrel cactus. for MaryAnn Orsary, You can order ladybugs form Gardens Alive or any other distributor of ladybugs. Ladybugs love aphids and are ferocious eaters. Release your ladybugs in the early evening after watering. They will first drink from the water droplets then feast upon your aphids. I have been doing this for 6 years now and within days, the aphids are almost completely gone. While sweetened Borax works, be aware it is harmful to pets. I can't use this method in my garden because my dogs can get into it. Hello Paul, I very much appreciated your "Ants in the garden" solutions. Although i have not tried any of the solutions yet because it has been raining, I believe one or more of the recipes will do the trick on my small infestation of ants in my newly made small backyard garden. They seem to be focused on my Cilantro! Which was growing very well at first! Then we noticed the buds slowly disappearing! I am going to try the viniger and water treatment first as it is readily available to me right now. If that doesnt work well enough I will search out the Borax and hope that does the trick! Thank you again! I will try to get back to you with my results soon! I live in north central Pennsylvania. 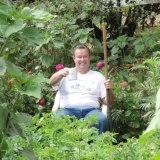 Have been organic gardening for 45 years. Have developed a very serious ant issue the past couple of years. They eat the hair roots off the plants and the seeds I plant. Two months ago I mixed equal amounts of borax and white processed surgar and spread it on my garden. I also spread some on the ant hills in my lawn. With in two weeks the grass around the ant hills was stone dead and still shows no signs of life. The plants in the garden did not die but became very sickly. Yield is 10% of what it should be. I assume it was the borax that caused this issue. Glenn, I haven't used borax as an herbicide but a quick Google search yielded many links to DIY herbicides made of borax or borax in combination with other ingredients. While plants need boron, too much of it will kill them. Perhaps try the borax-sugar mixture only on the ant hills and as a perimeter treatment around your garden where it won't get watered in? Ants are a tough one! Thanks for this post! I began seeing ants in my garden about 4 years ago. We built 6 raised beds from poured concrete in molds, 4X27 feet. Because they're 1' high I sit on the edge to plant & weed. These tiny buggers are inside gloves & shoes, sometimes clothes before I realize & they bite! Even if I stand they'll come out & get in my shoes! Ive set traps but there are just too many, in several areas of the beds & even in my flower beds under mulch, & in my herb garden. Often they win & I just have to avoid certain areas. I think I'll try the borax where I've already seen them & pray for victory! I have used the borax treatment with good results. However, as a beekeeper, bees and other beneficial nectar eating insects are drawn to the sweet concoction too. Simply cover a few cotton balls with the mixture and set on top of mound. Cover balls with a can or jar to keep beneficial insects from reaching it (as well as curious little puppies- lol). Re-bait as needed. Yes Im going through the same things in AZ! After having an exterminator come by, seems like he missed a spot and now they have gathered in masses in a corner of my backyard where 1 of 5 of my 6x3' garden beds are. It has gotten to the point where I cant even pick any of my peppers because these troopers are always on the attack! Constantly have to watch my feet/legs. Relied on my wife to get the exterminator back out, but population mass doesnt come out until late afternoon, so he only left some ant pellets-NOTHING! So, from reading this, Im shopping for some borax now... and also plants to attract more lacewings that will eat annoying aphids! Is borax safe for the plants and the people that eat them? Here's some information on borax as a pesticide: http://ipm.ucanr.edu/TOOLS/PNAI/pnaishow.php?id=16. Borax is safe for people and plants. It's actually a micronutrient for plants. I think the biggest concern for people is to be careful to avoid breathing in the dust when handling borax. Once it is applied in the garden it is not a concern, except for the pests! I have a 2 acre ,Sandy yard. It's wall to wall ants, hills everywhere. This is creeping me out. In my veggie garden I was almost covered with 3/4 "red ants. We're under cardboard I laid down. I'd like to eliminate all these ants and not harm bees or other beneficials. No pets outside, but bunnies, which I don't want to harm....deer and frogs too. Check out our IPM website on ants at http://ipm.ucanr.edu/PMG/PESTNOTES/pn7411.html. It will help you identify the ants and figure out the management strategy that will work best to control them. Good luck! i have just recently notice the leaves on my tomatoes and a couple nearby wild flowers curling then browning. it is really hurting my tomatoe plants as entire leaf branches, flowers and all, are dying! i havent a problem with aphids, i check my plants daily. at first i noticed a leaf branch or two dying, then curling and browning branches. i didnt check for a couple days and today, oh my! when i pluck a curling leaf branch, tons of ants!! i did not realize ants would destroy veggies and flowers, will they destroy them? and, what can i use besides the borax as we have lots of wildlife and a little wild kittie i have grown fond of who follows me around the yard! thank you, i will appreciate any help you can give!! This pestnotes http://ipm.ucanr.edu/PMG/PESTNOTES/pn7411.html has some information about ants in the garden. It states that they are usually a problem when they are attracted to honey dew producing insects such as aphids or soft scales. You state that you don't have an aphid problem, but perhaps you have scales? This website has more information about tomato pests: http://ipm.ucanr.edu/PMG/selectnewpest.tomatoes.html. Once you have figured out the pest then you will be in a better position to figure out how to treat your plants. Good luck! If you can't use borax due to pets or are worried about bees and butterflies get Terro traps. These co rain basically the same mixture but are enclosed so it's safe around pets. They have all kinds now to fit all ones needs.